I’m not a big seafood fan, although I can eat my share of scallops, shrimp, lobster, and fish. Crab legs are cool, but I was never successful eating them in an all-you-can-eat scenario. They’re just not that good enough for me to crave them all like that. 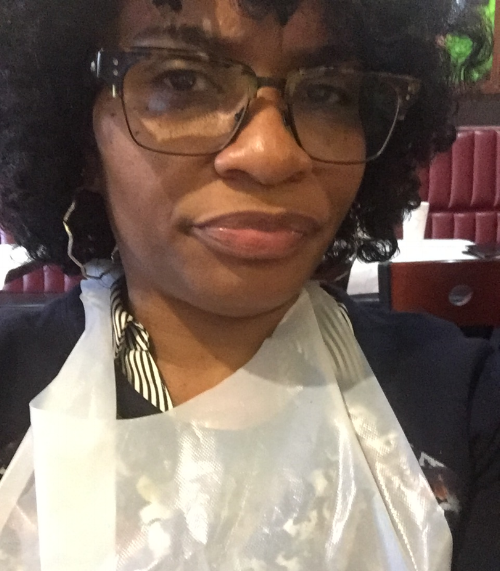 Recently, my family was in town from Dallas, Houston, and LA and because they're foodies, they wanted to check out all sorts of restaurants in CLE, including Boiling Seafood Crawfish on Lee Road in Cleveland Heights. Fun aside, there was something that I couldn’t help but notice at Boiling Seafood Crawfish. It wasn’t the decor, the menu of seafood options, or the prices on the menu. Anyway, I digress. Back to what I couldn’t help but notice. Josh, Sage, me, and Dawn chopping it up and working on those crab legs! After I ate my pound of crab legs (I split 2 pounds with my son) and ¼ pound of shrimp (I ordered a pound, but couldn’t eat them all because they were whole - head, eyes, and tail! Yikes! ), I noticed the mess we had made! Boiled seafood is a favorite of Cajun folks and I get it. All the spices, potatoes, and corn make a perfect dish for seafood lovers to enjoy. And I did enjoy the crab legs. But the mess I made didn’t make me happy. Although limited protection, I’m glad I wore the bib and gloves they provided. Don’t wear your favorite outfit. Although you’ll get a bib, it’s not big enough to cover your entire chest. Get extra pairs of gloves. I went through a couple of pairs cracking open the crab legs. Don’t order your seafood too spicy. That way you won’t have to drink water while you’re eating and get your cup all nasty. Go with a group and order different stuff on the menu to share. Be prepared to make a mess.